This Friday was very popular with record attendance for a Friday Night Club presenter. 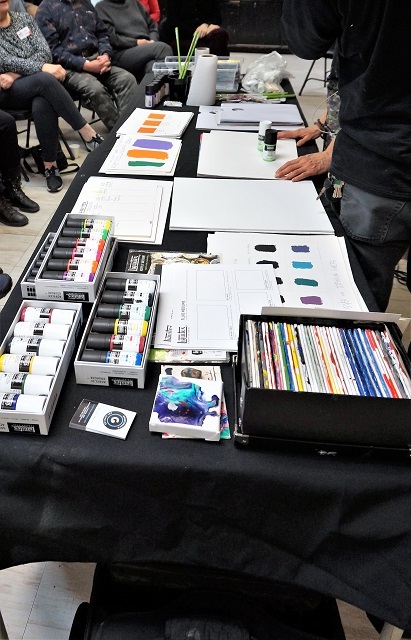 It might have been because Linda Montgomery is an award-winning illustrator, a reputable OCAD instructor and a very amiable presenter coupled with the promise of free goodies from Liquitex. 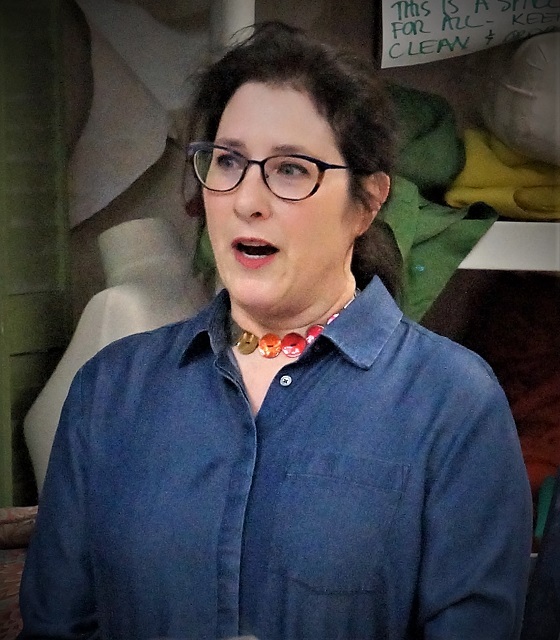 We had a surprise visit by Jacklyn Rosenblat-Gwartzman, proprietor of the celebrated Gwartzman’s Art Supplies on Spadina Avenue in Toronto and a supplier of Liquitex products. She shared the sad news of her father’s passing in February and offered discount coupons for members visiting her store, where they could pick up loot bags. This evening Linda talked about some new and improved products, namely acrylic gouache and soft bodied acrylic paint, acrylic inks etc. This low viscosity professional acrylic paint gives excellent coverage, a satin finish and high levels of artist-quality pigment for archival brilliance. It is very versatile and can be used to paint, pour, glaze or print on almost any surface. 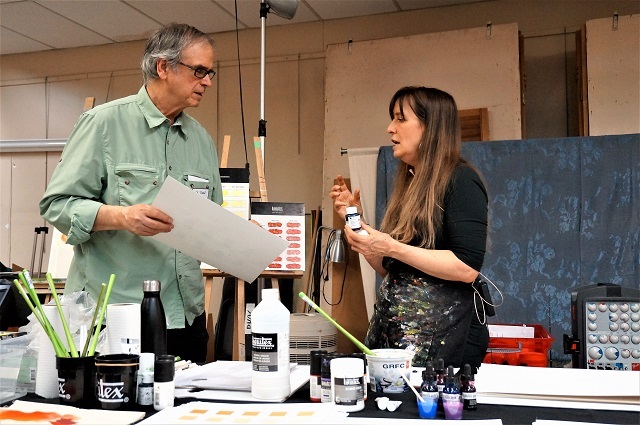 While many artists may think soft bodied is just a watered-down version of heavy body, Linda explained that the two paints have compatible binders and have the same pigment load. You just have to choose the right consistency for your project. It only makes sense to choose and softer consistency with some mediums like pouring medium. Conversely, one might be best to use heavy bodied paint when using pastes or heavy gel medium. Gouache, body color, opaque watercolor, or gouache, is one type of water media, paint consisting of natural pigment, water, a binding agent, and sometimes additional inert material. Gouache is designed to be used with opaque methods of painting. A primary difference between water colour and gouache paints is that gouache is more opaque than watercolor. 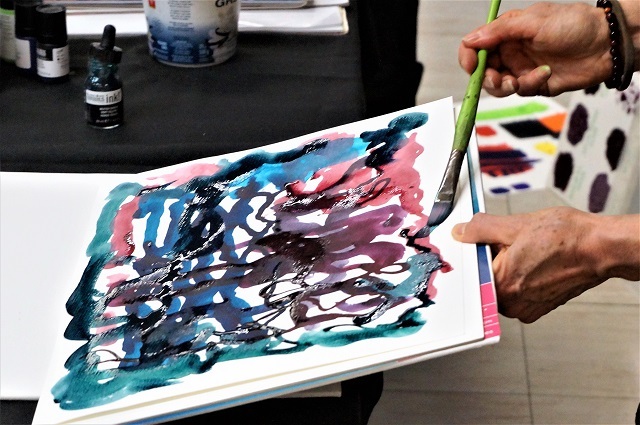 The opacity of gouache comes from the white pigment or chalk that is added along with the colored pigment and binder in order to make it less transparent. Acrylic gouache provides the most intense colors, a flat, matte effect, no brush strokes, no cracks and no need to dilute. Superb fluidity and application, all with a permanent, water-resistant finish when dry. Another feature of the above products was the new squeezable bottle with a spout that can be cut to allow for heavier application of the paint. Linda answered many questions verbally and with a demonstration and eliciting audience participation. She brought many samples of the properties of each medium and clearly has a penchant for art instruction. This was not Linda’s first visit to DVAC we hope it will not be the last.